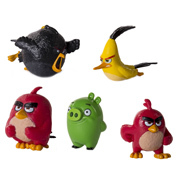 In a world where new gaming technology is being developed and released at a rapid pace, it was only a matter of time before Angry Birds were released as a range of toys. 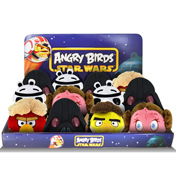 Angry Birds is a mobile phone game or application that has become a worldwide phenomenon since December 2009 when Rovio Mobile designed it in Finland and it was named the fourth best iPhone game of all time in September 2010. Angry Birds features hours of game play, challenging physics-based castle demolition, and lots of replay value. Each of the levels requires logic, skill, and brute force to crush the enemy. 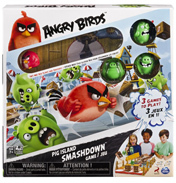 It features 195 levels, leader boards, achievements, Facebook and Twitter integration, and lots and lots of Angry Birds! The game consists of a flock of birds, which appear to have no legs or wings, being launched via slingshot at a group of evil green pigs that have stolen their eggs. In an effort to destroy the pigs either directly or by knowing structures down around them, the differently coloured birds wreak revenge in their own way as they each have their own unique set of skills and abilities. 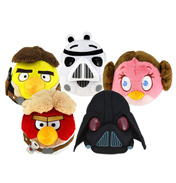 You are in the right place for Angry Bird Plush toys! Or watch the In Game Trailer below. All your favourite characters from the hit app game are available to collect so you can have your very own real world survival of the fittest. 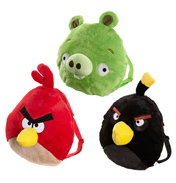 You can catapult your own Angry Bird with our Angry Birds Plush Toys, with or without sound effects. 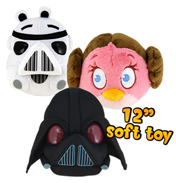 Alternatively children and adults of all ages can declare their devotion to these interesting characters by carrying around their very own backpack clip.